Every workshop generates waste, whether it be wood shavings, scrap metal, or fabric scraps, and sometimes that waste seems too good to throw away. 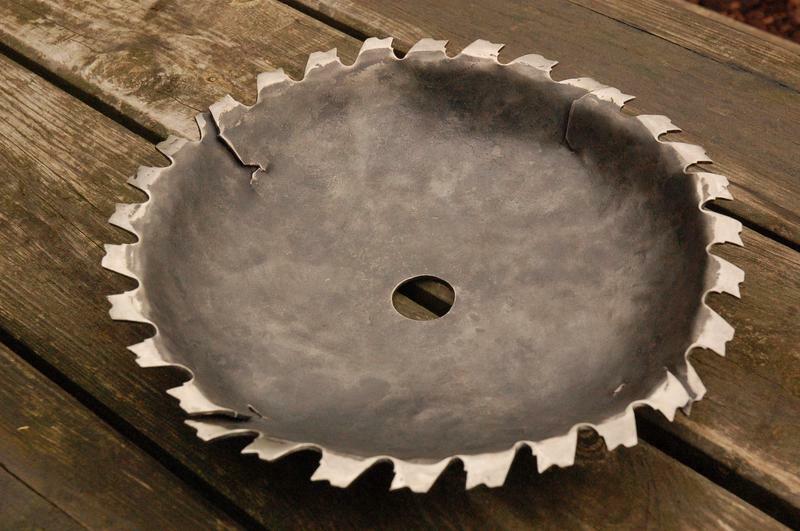 [Igor Nikolic]’s hackerspace had a ruined circular saw blade in the trash, and rather than let it go to waste he took it to the forge and fashioned a bowl from it. Then because another blade came his way and he wasn’t quite happy with the first one, he made another. The second of the two bowls, in its finished state. Saw blades are not promising material for forge work, being made of a very high-quality hardened steel they do not take well to hammering even when hot. So his first task was to anneal his blade in a kiln, heating it up and then letting it cool slowly to soften it. Working the blade into a bowl shape was done on a home-made ball anvil. The blade was marked to provide guide rings as an aid to forming, and the bowl shape was progressively built out from the center. The first bowl was a little irregular, in his second try he’d got into his stride. Both bowls were mounted, one on a cut acrylic base, the other on a set of feet. A project such as this can only be done with a huge amount of work, for which owners of larger forges will typically use a power hammer. [Igor] admits that a swage block (a specialized anvil for forming such curved shapes) would have made his life easier, but we think he’s done a pretty good job. If you’ve been paying attention to recent Hackaday articles you may have noticed the start of our series on blacksmithing. We’re indebted to [Igor] for the genesis of that piece, for he was operating the portable forge that features in it. Blacksmithing For The Uninitiated: What is a Forge? Blacksmiths were the high technologists of fabrication up until the industrial revolution gained momentum. At its core, this is the art and science of making any needed tool or mechanism out of metal. Are you using the correct metal? Is the tool strong where it needs to be? And how can you finish a project quickly, efficiently, and beautifully? These are lessons Blacksmiths feel in their bones and it’s well worth exploring the field yourself to appreciate the knowledge base that exists at any well-used forge. I had an unexpected experience a few days ago at the Hacker Hotel weekend hacker camp in the Netherlands. At the side of the hotel our friends at RevSpace in The Hague had set up a portable forge. There was the evocative coal fire smell of burning coke from the hearth, an anvil, and the sound of hammering. This is intensely familiar to me, because I grew up around it. He may be retired now, but my dad is a blacksmith whose work lay mostly in high-end architectural ironwork. Working the RevSpace forge at Hacker Hotel, in not the most appropriate clothing for the job. The trouble is, despite all that upbringing, I don’t consider myself to be a blacksmith. Sure, I am very familiar with forge work and can bash metal with the best of them, but I know blacksmiths. I can’t do everything my dad could, and there are people we’d encounter who are artists with metal. They can bend and shape it to their will in the way I can mould words or casually solder a tiny surface-mount component, and produce beautiful things in doing so. 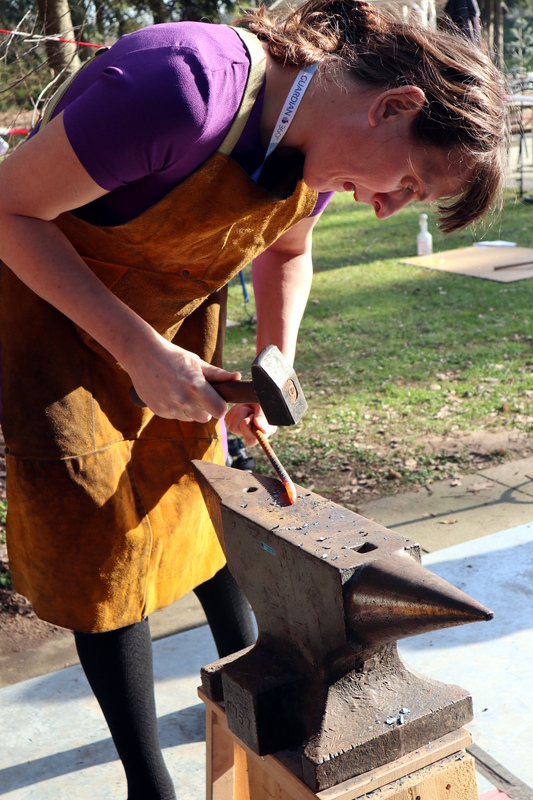 My enthusiastic metal-bashing may bear the mark of some experience at the anvil but I am not one of them. It was a bit of a surprise then to see the RevSpace forge, and I found myself borrowing a blacksmith’s apron to protect my smart officewear and grabbing a bit of rebar. I set to and made a pretty simple standard of the dilletante blacksmith, a poker with a ring on one end. Hammer one end of the rebar down to a point, square off the other end for just over 3 times the diameter of the ring, then bend a right angle and form the ring on the pointy end of the anvil. Ten minutes or so of fun in the Dutch sunshine. Working a forge unexpectedly brought with it a bit of a revelation. I may not be a smith of a high standard, but I have a set of skills by virtue of my upbringing that I had to some extent ignored. Where others might have put effort into learning them, they’re things I just know. It had perhaps never occurred to me that maybe all my friends in this community didn’t learn how to do this by hanging round the forge next to the house they grew up in. If I have this knowledge merely by virtue of my upbringing, perhaps I should share some of it in a series of articles for those in our community who’ve always fancied a go at a forge but have no idea where to start.